Here at Ceilume we pride ourselves on having legendary customer service. We're here to help if you have questions, would like to see free samples, need assistance placing an order, or have a burning desire to know more about pinball (Noah), fishing (not Ben), or motorcycles (David). We seem to be having some difficulty sending the contact-us form. Sorry about that! Please contact us at 1-800-557-0654 or info@ceilume.com and we'll do our best to help you out! For those of you who like to brave it on your own, check out the concise (yet thorough!) FAQs listed below. 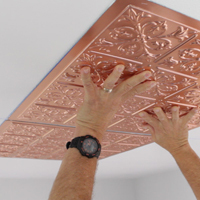 How do I choose the right ceiling tile for my installation? Shopping for ceiling tiles can be confusing. 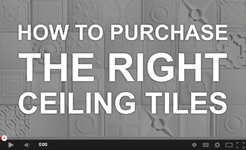 Luckily, we understand and make it easy to choose the right ceiling tile for your installation. Simply watch the short video, answer a couple of questions, and we'll present you with the best options for your ceiling. It's like a "choose your own adventure" book... but without the adventure... and with more ceiling tiles! Why is a thin ceiling tile better? Thin ceiling tiles are better because they are lighter, cleaner, more resource-efficient (our design uses 75% less raw material to manufacture and is five times more efficient to ship), and easier to install. When you look up at your ceiling, you see its decorative face and not its thickness. Our light weight ceiling panels may leave you a bit skeptical at first, but place them in your ceiling and we promise that you'll agree that their thin design is one of their greatest benefits! Will your ceiling tiles improve my acoustics? 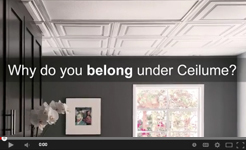 A better question might be: Will most ceiling tiles (including those marketed as "acoustical"!) improve my acoustics? Tecnically? Yes. Realistically? Not much. Given the moderate acoustical performance of most suspended ceilings (NRC of 0.05 - 0.55), from an acoustical performance standpoint, our thermoformed panels (NRC of 0.25 - 0.45) are more than suitable for a variety of commercial, office, residential, and institutional occupancies. 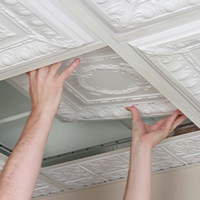 Check out our article on Acoustic Ceiling Tiles for an in-depth explanantion of room acoustics. In the mean time, the abbreviated answer to your question is that most suspended ceiling tiles (unless they are very specialized and very expensive) will not noticeably (for most ears) change your in-room acoustics (NRC), nor will they reduce the amount of pass-through noise (STC) from your room to other areas of your home or business. That being said, our Soniguard™ Drop Ceiling Insulation dramatically improves the acoustical performance of any drop ceiling, and, when paired with our ceiling tiles, will create a cost-effective but beautiful acoustical ceiling. Are your tiles Class A rated? Yes. All of our ceiling panels and tiles are Class A rated for surface-burning characteristics per ASTM E84-14..
Can your tiles be installed in humid or wet locations? Yup! 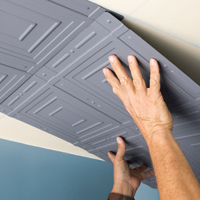 One of the many benefits of a vinyl ceiling tile is that it's 100% waterproof. Our ceiling panels are not affected by humidity, do not absorb water, do not harbor mold or mildew, and will resist moisture-related sagging and staining. How much do your tiles cost? Check out our nifty pricing calculator, go to a specific product page and enter a quantity (prices automagically update to include any volume discounts), or navigate the tables below. Your choice! Prices are based on size, collection, color/finish, and the quantity of ceiling tiles or ceiling panels being purchased. For example, if you purchase 105 Stratford Ceiling Tiles (part of the Feather-Light Collection) in white, your price would be $5.45 per tile for a total of $572.25 (tax/shipping not included in the prices below). In addition to the tables below, pricing is included on every product page, and will be calculated automatically in the shopping cart. How many ceiling tiles do I need? Each 2' x 2' ceiling tile is 4 sq. ft. and each 2' x 4' ceiling panel is 8 sq. ft. 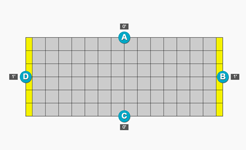 In order to find out how many tiles you will need, simply take the area of your room and divide that by 4 (for ceiling tiles) or 8 (for ceiling panels). But we know life is rarely that easy, so we've created an amazing (stupendous, even) materials calculator for you to use. Complete a few steps and we'll tell you how many tiles (or panels!) you need and even show you a diagram of what your ceiling will look like. What if my installation requires less than 25 ceiling tiles? In order to ensure that you get the best price possible and to allow us to provide those of you in the lower 48 states with free shipping, we ask that your total ceiling tile order consist of at least 25 items before you check out. These items can be any combination of ceiling tiles and accessories. We offer free shipping to the lower 48 states and will get your tiles to you in two weeks or less. If you need to feel and hold the product, give us a call and we'll send you some free samples to ensure that our products are right for your installation. Do you have [ X ] in stock? Since we have over 30 ceiling tile styles in two sizes and many different colors and finishes, we can't stock them all. All of our tiles are custom made to order for you. Tiles don't get any fresher! Please give us a call if you need your order in less than two weeks and we will be glad to see what we can do to get your order out the door as quickly as possible. How do I install my new ceiling tiles? How do I cut and trim my tiles for use along ceiling borders? 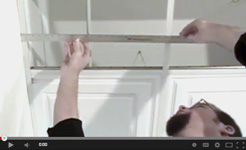 Measuring, cutting, and installing partial ceiling tiles along ceiling border areas couldn't be easier. Eh... that's not quite true... We suppose it COULD probably be easier if you had a robot to do it for you... but barring ceiling tile installing robots, it couldn't be easier! Watch the video and you'll see what we mean. Note: the video is for suspended ceiling tiles, but direct-mount ceiling tiles are pretty much the same (less grid, more glue). Suspended ceilings and recessed lights were made for each other, and the lightweight design of our ceiling tiles makes the process easier than ever (not that we're biased or anything). Watch our can lighting video for detailed instructions, but to make a long story short: remove tile from grid, measure, cut hole, install grid-mounted light fixture, re-install tile, finish with trim ring. Done. Can I use insulation in combination with your ceiling tiles? 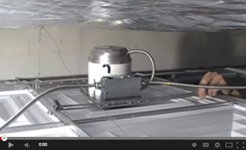 Install Soniguard™ Drop Ceiling Insulation above your ceiling tiles. Specifically designed to be used with ceiling tiles of all types (vinyl, mineral fiber, and tin), Soniguard is pre-cut for easy installation, fiberglass (itch) free, super lightweight, and will drastically improve both the R-value (warmer room in winter, cooler room in summer) and acoustical performance of your ceiling. Insulate the hidden ceiling structure above your suspended ceiling. This insulation might take the form of insulation batts stapled between the rafters or floor joists from which your drop ceiling grid is hung, or of rigid insulation mounted directly to the ceiling structure above the T-bar. Can I paint my ceiling tiles? Most definitely! All of our ceiling tiles (and decorative strips and decorative grid tape) can be painted right out of the box or after you install them. Painting voids all fire ratings and approvals. Always paint-match the actual products that you are planning on installing. 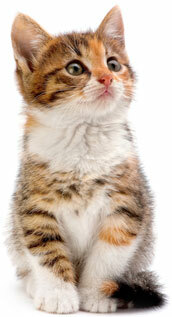 Do not use solvent-type thinners and cleaners. How do I clean my ceiling tiles? Wet soft rag, wipe down tile, celebrate. In-depth explanations of some of our more important policies. Please let us know if you have additional questions!